Junction4 as it will be known will open later this year at the former Blackburn Rovers Sports Arena off Bolton Road, next door to Darwen Vale High School. It will be a multi- purpose facility which can be used by BMX bikes, skateboards, roller blades and scooters. A consultation on the name for the much anticipated facility was held with more than 500 potential users of the facility. Suggestions came in via social media and through local bmx riders and skateboarders via Paul Bury at the Cellblock. 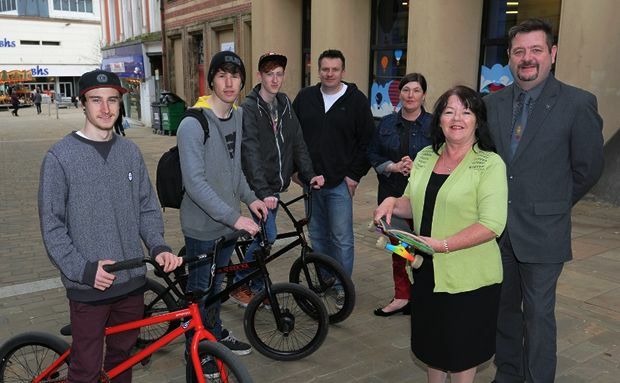 The parenting group who brought the petition for a skate park facility to the Council were also involved in the discussions. Finally, Junction4 was selected as the most popular. The tender process for construction of the new BMX / skate park at Blackburn Rovers Sports Arena is currently underway. A number of companies specialising in the construction of such facilities have submitted completed tenders to the department for evaluation. Award of the tender will take place late-April, with construction of the park on schedule to be completed in summer 2014. At present, people have to travel to Preston and Manchester for indoor skate facilities and to Clitheroe and Blackpool for good quality outdoor skateparks. There is a clear demand for a facility in the borough and the location is ideal – being on the main bus route between Darwen and Blackburn, on a cycle route from the local train stations and for those coming from further afield, being just off junction 4 of the M65.